Grundig MPixx VP6200 is an integration 30 GB hard disk portable media player capable of playing and recording digital music, photos and videos with support of MP3, WMA, JPEG, MPEG 4 (DivX, XviD) and other common file formats. Grundig VP6200 features a high-resolution 3.5″ TFT-LCD display with 64,000 colours and a panning camera with 1.3 megapixels and 4x digital zoom for video recordings. The media player also can receive FM radio. 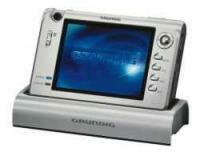 ComputerAct!ve gave Grundig MPixx VP6200 multimedia player rating of 4 out of 5 and concluded that the Grundig VP6200 is compact and versatile, but its expensive compared to other similar devices. In all, the VP6200 performs very well, boasts heaps of features and offers a decent amount of storage space. However, shop around and you’ll find similar devices for a fraction of the cost.